Wilkes-Barre is a paradise for all outdoor enthusiasts. When in the city, you can choose from a wide range of exciting activities such as kayaking, hiking, whitewater rafting and much more. The city is a popular destination for travelers, thanks to its 4 state parks and a number of ski areas. Book flights to Wilkes-Barre to explore numerous art galleries and museums with exhibits showcasing the rich past of the city and its early inhabitants. The city of Wilkes-Barre, founded in the year 1769, is located at the center of the Wyoming Valley. The northwestern border of the former coal town is defined by the Susquehanna River that flows through the center of the Wyoming Valley. Book cheap flights to Wilkes-Barre to discover what the largest city in Luzerne County has to offer. 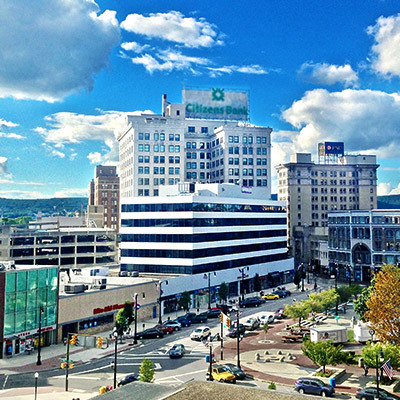 Wilkes-Barre is named after John Wilkes and Isaac Barre, members of the British Parliament. Ironically, Wilkes and Barre never visited the city named after them. The easiest way to enter the city is via the highways. You can also reach the city in 15 minutes from the Wilkes-Barre/Scranton International Airport if you are traveling by air. Getting around in the city is easy thanks to public buses. Visiting Wilkes-Barre isn't just about adventure and history, the city is also known for its authentic diner car restaurants, some of which are open 24 hours. Do visit Cork Bar & Restaurant, The Stations Grill, El Rey Azteca and La Tolteca to try some mouth-watering delicacies. Mohegan Sun Pocono- When in Wilkes-Barre, this will be your destination for entertainment, shopping, gaming and dinning. It is also where you can play a few hands, roll some dices and test your luck at the casino. The resort comprises of 239-rooms, on-site spa facilities as well as a convention center. It also includes 82,000 square feet of gaming space that houses over 90 table games, 2,300 slot machines and electronic table games and a number of dining and shopping options. Visit Breakers and Bar Louie on a weekend and enjoy live music played by the best local bands. After you're done with entertainment, you can explore and shop for apparels, jewelry, gadgets and much more. Seven Tubs Nature Area- This is a recreational area located near Plains Township, Pennsylvania. The area has drawn the name 'Seven Tubs' from the flow of water melted from glaciers that created potholes and filled up tubs of water. This is a great place to hike, with most of the trails running parallel to creeks, streams and natural tubs. Book cheap flights to Wilkes-Barre and visit this hidden gemstone anytime between May and June. Little Theater of Wilkes-Barre- Since its inception in 1922, the Little Theater of Wilkes-Barre has reached more than two million people with its hundreds of productions. Tickets can be bought online from their official website. The River Street Jazz Cafe - This is a cafe with live-music that specializes in hosting jazz musicians and serving delicious food. M. Kirby Center for the Performing Arts- Built in the year 1937 as Comer ford Movie Theater, the F.M. Kirby Center for the Performing Arts is a movie theater located in the Luzerne County. Mohegan Sun Arena at Casey Plaza- This is an 8,050- seat multi-purpose stadium located in Luzerne County. Since 1999, the arena has been a home to the Wilkes-Barre/ Scranton Penguins. The arena has hosted some of the biggest names in the music industry like The Eagles, Elton John and Janet Jackson. Carnegie Museum of Natural History- This museum boasts of over 20 million specimens, objects and artifacts that have been collected over decades. The museum also contains one of the largest collections of dinosaur fossils, in the world. Apart from being a tourist attraction, the museum is also an outstanding research institution. A visit to the museum will cost $19.95 for adults, $14.95 to seniors aged above 65 years and $11.95 for students with ID card. You can also visit the museum after 3 pm on weekdays to avail 50% discount on the admission fee. The museum remains closed on Tuesdays. Riverside-The Inn at Cambridge Springs- From Broadway-style musicals to murder mysteries, the theater hosts over 100 performances each year. The 200 seat theater that is open from April to December is located in the Riverside Inn. Situated on the banks of French Creek, the theater is merely 90 miles away from Buffalo and Pittsburgh. In the wedding season, the theater turns into an ideal destination-wedding spot. It has been proved that spending time in nature helps in recovering from illnesses and is vital to our overall health. So, hop-on a last minute flight to Wilkes-Barre to explore and hike along the natural tubs at the Seven Tubs Natural Area in the city.